Background/Aim: Due to epidemic levels of obesity and type 2 diabetes mellitus (DM), nonalcoholic fatty liver disease (NAFLD) and resulting nonalcoholic steatohepatitis (NASH) will be driving factors in liver disease burden in the coming years in Saudi Arabia and United Arab Emirates (UAE). 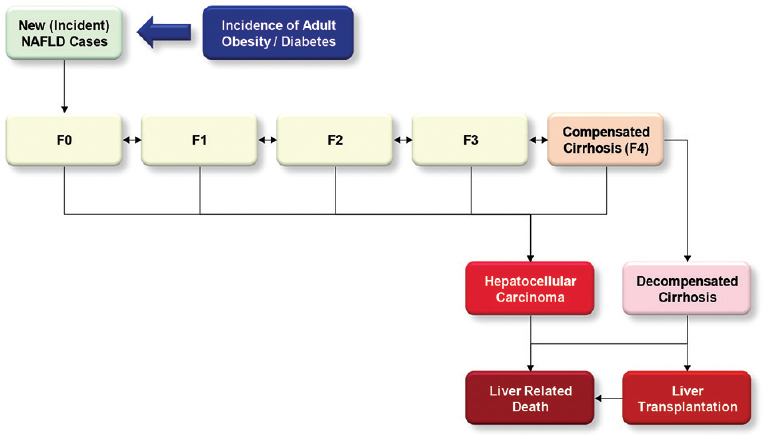 Materials and Methods: Models were used to estimate NAFLD and NASH disease progression, primarily based on changes in adult prevalence rates of adult obesity and DM. The published estimates and expert interviews were used to build and validate the model projections. Results: In both countries, the prevalence of NAFLD increased through 2030 parallel to projected increases in the prevalence of obesity and DM. By 2030, there were an estimated 12,534,000 NAFLD cases in Saudi Arabia and 372,000 cases in UAE. Increases in NASH cases were relatively greater than the NAFLD cases due to aging of the population and disease progression. Likewise, prevalent cases of compensated cirrhosis and advanced liver disease are projected to at least double by 2030, while annual incident liver deaths increase in both countries to 4800 deaths in Saudi Arabia and 140 deaths in UAE. Conclusions: Continued high rates of adult obesity and DM, in combination with aging populations, suggest that advanced liver disease and mortality attributable to NAFLD/NASH will increase across both countries. Reducing the growth of the NAFLD population, along with potential therapeutic options, will be needed to reduce liver disease burden. Background/Aim: Bleeding risk among patients with acute or chronic liver disease after invasive procedures is a common concern in clinical practice. This retrospective study aimed to explore whether the presence of coagulopathy increased the risk of major bleeding after invasive procedures in cirrhosis. Patients and Methods: A total of 874 cirrhotic patients underwent invasive procedures. Coagulopathy was defined as international normalized ratio (INR) ≥1.5 and/or platelets (PLTs) ≤50 × 109/L. Severe thrombocytopenia was defined as PLTs ≤ 50 × 109/L. Invasive procedures, major bleeding after invasive procedures, and in-hospital deaths were recorded. Results: In all, 296 patients (33.9%) had coagulopathy. Major bleeding after invasive procedures occurred in 21 patients (2.4%). Major bleeding after invasive procedures was more frequent in patients with coagulopathy than those without coagulopathy (4.1% vs 1.6%, P = 0.023). Major bleeding after invasive procedures was more frequent in patients with severe thrombocytopenia than those without severe thrombocytopenia (4.9% vs 1.6%, P = 0.008). Incidence of major bleeding after invasive procedures was not significantly different between patients with INR ≥ 1.5 and INR < 1.5 (4.5% vs 2.0%, P = 0.065). Patients with INR ≥1.5 had a significantly higher in-hospital mortality than those with INR < 1.5 (6.4% vs 1.3%, P < 0.001). Conclusion: Severe thrombocytopenia significantly increased the risk of major bleeding after invasive procedures in cirrhosis. INR ≥ 1.5 significantly increased in-hospital mortality. Background/Aim: The purpose of this study was to establish a modified rat model with functional dyspepsia (FD) and analyze the changes in gastrointestinal motility and brain-gut peptide levels in serum and brain-gut axis. Materials and Methods: Male Wistar rats were divided into control group (Con) and FD model group. FD model was established by stimulating semi-starvation rats via tail damping, provocation, and forced exercise fatigue until gastrointestinal motility disorder appeared, and then levels of motilin, leptin, cholecystokinin (CCK), and vasoactive intestinal peptide (VIP) were detected in serum by enzyme linked immunosorbent assay and in duodenum, antrum, and hypothalamus by immunohistochemistry, reverse transcriptase-polymerase chain reaction, and Western blot. 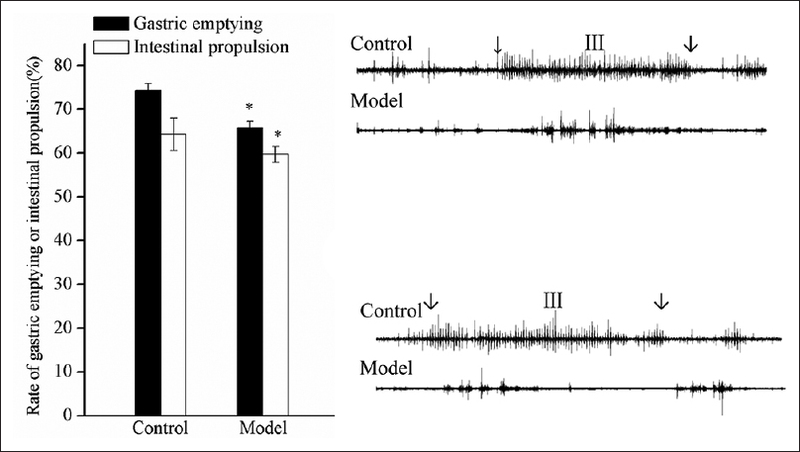 Results: The results showed rates of intestinal propulsion and gastric emptying slowed down markedly compared to Con (P < 0.05), the gastrointestinal electric activity attenuated, and migrating motor complex (MMC) interrupted in the model group. The levels of leptin and VIP markedly increased, but motilin decreased as compared to the Con (P < 0.05) in serum and in the above tissues. It is interesting that the level of CCK decreased in the antrum and duodenum but increased in the hypothalamus as compared to Con (P < 0.05). Conclusions: The modified rat model meets the diagnostic criteria of FD and can be used as a method for studying FD in animals. Background/Aims: Gastroesophageal reflux disease (GERD) is a common condition that can lead to significant morbidity. Laryngopharyngeal reflux (LPR) is a distinct clinical entity that can occur simultaneously with GERD, necessitating additional treatment measures. The degree of overlap and clinical predictors of LPR among patients with GERD remains unknown. We aim to measure the prevalence of LPR in patients with GERD and identify clinical predictors. 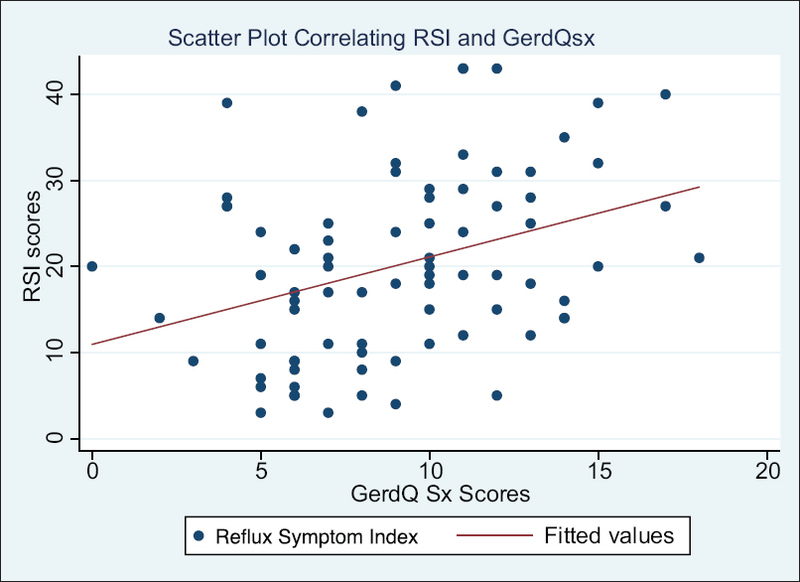 Patients and Methods: We performed a cross-sectional study involving patients with confirmed GERD according to the GERD questionnaire (GerdQ) using the reflux symptom index (RSI). Data on demographics, comorbidities, past and current medications, and GERD-related lifestyle measures were documented. The prevalence of LPR was calculated. Linear and logistic regression analyses were conducted to correlate GerdQ and RSI, and to identify clinical predictors of LPR, respectively. Results: A total of 80 patients with confirmed GERD were consecutively recruited and surveyed. Mean age was 43 (±16) and 60% were females. The majority of patients were Saudis (51%) and only 24% were smokers. The mean duration of GERD was 7 (±4.4) years and the average body mass index (BMI) was 36 ± 22. Sixty-six percent of the patients consumed coffee on regular basis. On simple and multiple linear regression analyses, a strong, positive correlation was observed between the GerdQ and RSI scores (coefficient = 1.13, 95%CI = 0.39–1.86), and ipratropium bromide inhaler was positively associated with RSI scores (coefficient = 13.12, 95%CI = 0.16–26.09). LPR was identified in 57 patients (71%). On simple and multiple logistic regression analyses, GerdQ scores (OR = 1.78, 95%CI = 1.13–2.80), BMI (OR = 1.07, 95%CI = 1.01–1.14), duration of GERD in years (OR = 1.42, 95%CI = 1.04–1.93), and the type of gender (OR = 49.67, 95%CI = 1.32–1870) appeared to increase the risk of LPR, whereas coffee consumption (OR = 0.0005, 95%CI = 1.82e–06, 0.13) appeared to be negatively associated with LPR. Conclusions: Contradictory to what is frequently reported, LPR commonly occurs and positively correlates with GERD. Several modifiable clinical predictors of LPR might exist, which highlight the importance of performing a complete clinical assessment of the patients with reflux symptoms. Background/Aim: We studied the expression of interleukin-17 and interleukin-22 in the serum and the lower esophageal sphincter (LES) in healthy individuals and in patients diagnosed with achalasia (AC) to gain a better understanding of the etiopathogenesis of AC. Patients and Methods: Our study comprised 14 randomly selected patients with AC who underwent peroral endoscopic myotomy and 14 randomly selected healthy individuals who served as controls. Venous blood samples were evaluated in all study subjects to detect the expression of interleukin-17 and interleukin-22 in the serum using an enzyme-linked immunosorbent assay. Immunohistochemistry studies were performed to evaluate LES myofilaments obtained from both groups, as well as from 12 patients diagnosed with a subendothelial non-invasive tumor and who had undergone submucosal tunneling endoscopic resection, to assess the expression of interleukin-17 and interleukin-22 in LES myofilaments. Results: Compared with that in the control group, the expression of interleukin-17 and interleukin-22 in the serum and LES, in patients with AC, was significantly increased and was positively correlated. Conclusion: Interleukin-17 and interleukin-22 are upregulated in the serum and LES in patients with AC, suggesting that both interleukin-17 and interleukin-22 are involved in the pathogenesis of AC, and that AC may be an immune-mediated inflammatory disease. Background/Aim: It is important to eradicate Helicobacter pylori at an early stage in patients during childhood to potentially prevent the development of H. pylori-related diseases. Studies have demonstrated that the virulence genotype of H. pylori influences the efficacy of eradication therapy. The efficacy of triple therapy has decreased significantly, which has seriously affected the clinical outcome of children with H. pylori infection. 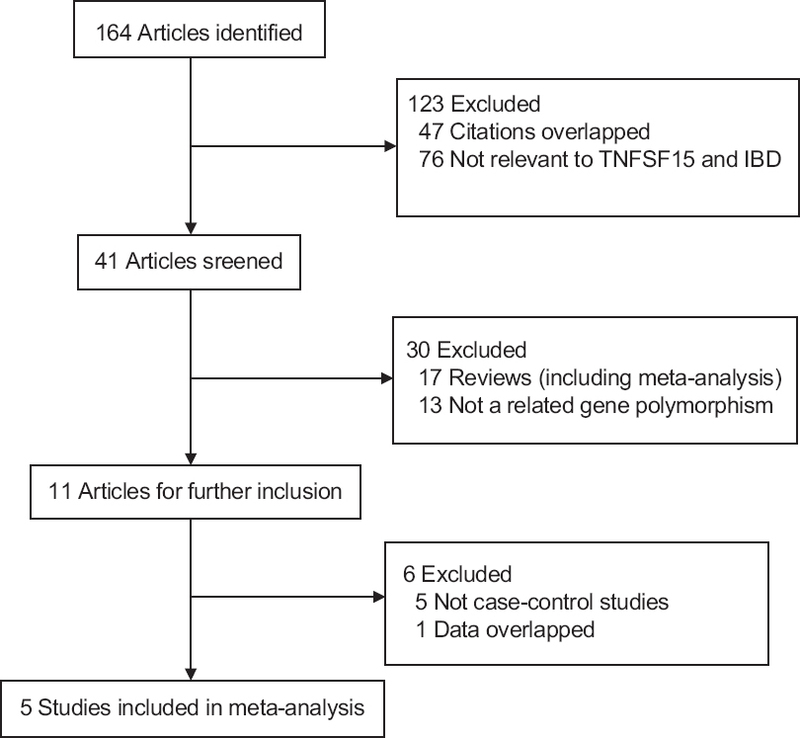 In this study we aimed to investigate the influence of virulence genotypes of H. pylori on triple eradication therapy in children. 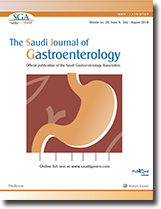 Patients and Methods: H. pylori strains were isolated from the gastric antrum mucosa in children with upper gastrointestinal symptoms. Polymerase chain reaction (PCR) was conducted to determine the H. pylori cagA, vacA, and iceA genotypes. All patients with H. pylori infection were administered 14-day triple therapy. After drug withdrawal for at least 4 weeks, the 13C-urea breath test (13C-UBT) was used to observe the therapeutic effect of H. pylori eradication. The eradication rates were evaluated by intention-to-treat (ITT) and per-protocol (PP) analyses. Results: A total of 107 patients were enrolled in this study. Nine patients were lost to follow-up, and 98 patients were administered eradication therapy. Based on ITT and PP analyses, the H. pylori eradication rate was 64.5% (69/107) and 70.4% (69/98), respectively. Among the successful eradication groups, the cagA-positive, vacA s1a, vacA s1c, vacA m1, vacA m2, iceA 1, and iceA 2 genes were identified in 72.8%, 68.1%, 76.9%, 60.0%, 74.6%, 71.8%, and 75.0% of strains, respectively. Of the unsuccessful eradication groups, the cagA-positive, vacA s1a, vacA s1c, vacA m1, vacA m2, iceA 1, and iceA 2 genes were identified in 27.2%, 31.9%, 23.1%, 40.0%, 25.4%, 28.2%, and 25.0% of strains, respectively. No statistically significant differences were noted in the detection rate of the H. pylori genotypes between the H. pylori successful and unsuccessful eradication groups (P > 0.05). Conclusions: The cagA, vacA, and iceA genotypes of H. pylori are not associated with the efficacy of omeprazole-based triple therapy on the eradication of H. pylori infection in children.